I’ve partied all night, fallen asleep diagonally and woken with an infomercial on, fully dressed, but I don’t stress, because I’m in Dublin. The code is 10 times more relaxed than in London or New York. The coffee though is just as intense when brewed by three-time Irish Barista Champion, Colin Harmon. A man with a mission to “keep amazing coffee to Dublin” Colin turned down many invitations to open coffee bars in Europe in favor of Dublin. He sources and serves single origin roasted coffee beans from Has Bean and approaches coffee making with a pedantic passion. The permanent line here says it all. I’ve just come out of a great meeting. I hope for your sake that you never see me like this, sweaty, a dumb winner’s smile and the rosiest cheeks you ever did see. No more description necessary. If I were in Paris I’d climb the Eiffel Tower, New York? The Empire State Building, but I’m Irish so I head for the tallest building serving Guinness which is The Gravity Bar at the Guinness Storehouse – (located 46 metres off the ground), – it’s the highest bar in Dublin. Downstairs is the headquarters where Guinness is brewed and if you don’t have the time to pop down, here are a few things you’ll need to know. Both here and abroad over ten million glasses of Guinness are now enjoyed around the world every day. Made from barley, hops, yeast and water that flows from the Wicklow Mountains, it’s poured at an angle of 45 degrees and takes 119.5 seconds for the perfect pint to settle. When held up to the light, it’s a deep burgundy colour and not black. Oh and its quality control is dependent on the opinion of visitors, so you must be honest with your barman. Loads of feedback is crucial. Personally I think the best Guinness (and cheese toasties) are served at Grogans where artists, poets writers and Dublin’s young talent converge on this city centre joy. It’s everything a pub should be and more. Grogans, 15 South William Street. Psssssst! The Long Hall, 51 Great George’s St, Dublin 2 (Tel: +353 1 4751590) also serves a great Guinness. Shhhhhh! Did I just tell you that? Hope it’s not too packed now. I have a meeting with a client about a photo-shoot (where I’m meant to come up with the concept), same red face as above + this time more perspiration because I’ve no ideas. Where do I go? 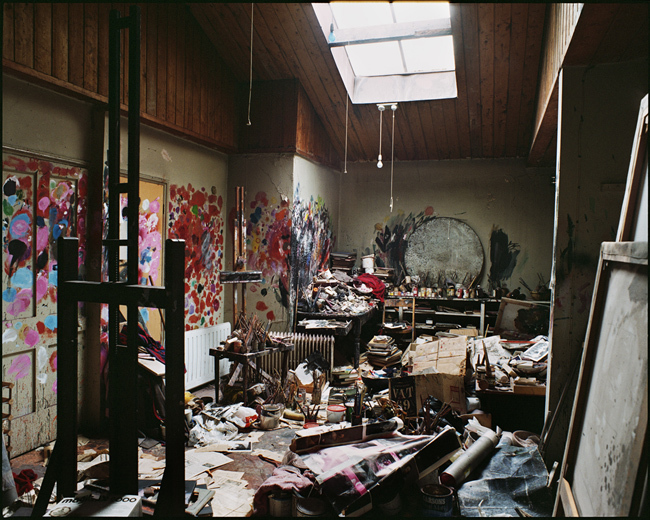 I go and sit and look at The Francis Bacon Studio. 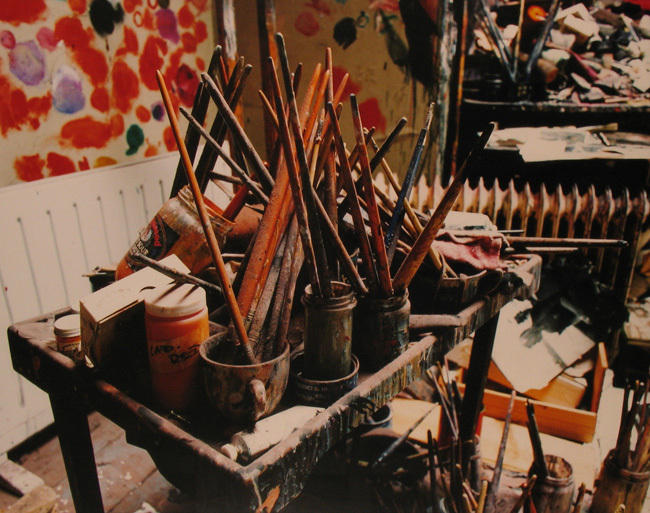 He was one of the greatest artists of the twentieth century, died in 1992, and the contents of his studio at 7 Reece Mews, South Kensington, London along with his long-held art secrets were moved here. The laborious way in which he worked, the process is extremely inspiring. 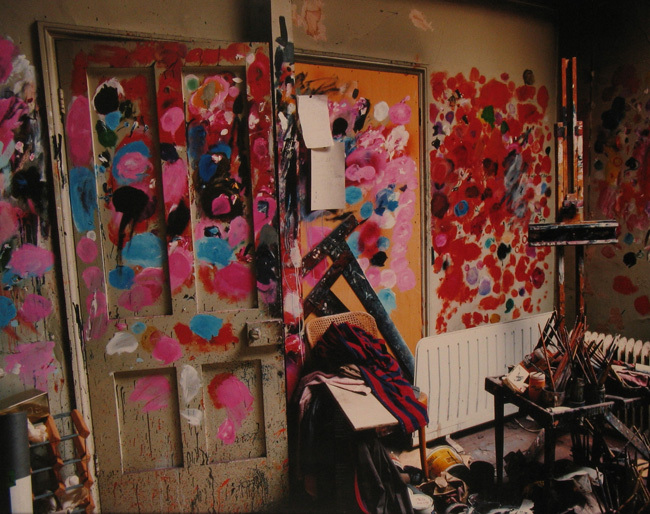 His whole studio right down to the last scrap of paper is here including corduroy trousers, socks, cashmere sweaters cut into pieces which he used to soak up paint from his studio door. To see all this up close is really thought provoking. A must see! Same as above, I have a meeting with a client, but because it’s Dublin it might (read is) probably raining so I use the weather as an excuse to step indoors and visit my favourite friends at the Natural Museum of Ireland. You could say I’m pulling a wild half hour, hanging out with my friends to help put things into perspective. As soon as I arrive I take a good look around at the crowd. Everyone is so beautiful, but there’s this coolitude attitude that feels pretty different from most gatherings because well they’re very laid back, they’re taxidermy. (No worries, sleep soundly everyone, I’m not naming any names…) I visit this gallery of animals from Ireland and overseas displayed from a total collection of about 2 million scientific specimens and appreciate its vast hugeness. These guys make me instantly feel small and insignificant and childlike and that’s always a great way to spark ideas. No? The National History Museum of Ireland , Merrion Square, (Tel: 01 6777444). If I’ve got a birthday/wedding/bar mitzvah to attend as a writer I’m taxed with finding an appropriate gift. I used to fail miserably at this until I started truffle hunting in my favourite bookshops. The digital era hasn’t stopped my deep love for a printed publication, and I find that readers are both charmed and elated to get their hands on a first edition book that will sit proudly on their shelves. A first edition Joyce, Yeats or other rare title from Cathach Books is the most wonderful gift. Alternatively, for those books I end up reading a million times until the book spines bend out of shape I buy vintage at the The Winding Stair bookstore. One of my favourite lunchtime spots, Juniors Deli and Café, starts the day with a huge pile of sandwiches. Worringly, they also start the day with ‘Riders on the Storm’ by the Doors, but you can’t have it all. Their BLT is an excellent update on an old classic with crisp bacon, rocket instead of lettuce (it is 2012 after all), and it’s served between one of the nicest crusty rolls. So good in fact, you’ll probably also want to try their Hero or one of their many other great sandwiches or lunch specials. Dinner here with friends is also quite cosy. On that, I’ll let you go, but remind me to talk to you about the average level of fashion cool in Dublin, OK? I think it’s worth its own post. In the meantime if you’ve tried any of the aforementioned let me know how you got on. AND… This is just a handful of great places: see Dublin’s pretty darn cool. I love it. 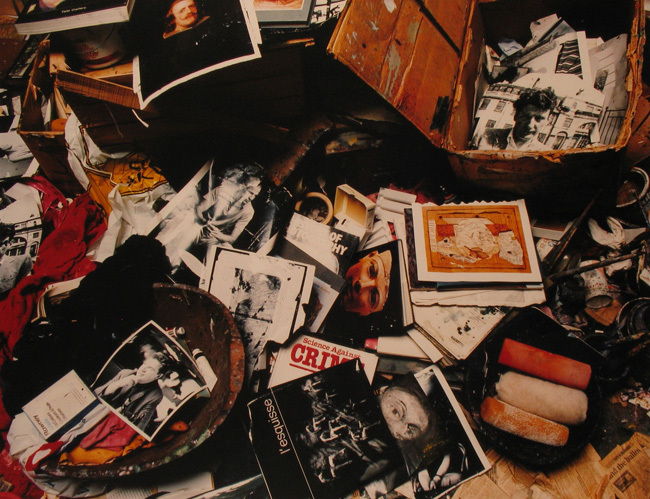 With special thanks to The Estate of Francis Bacon for images taken by Perry Ogden of The Francis Bacon’s Studio from the Collection at The Dublin City Gallery The Hugh Lane. In the past few weeks I’ve had interview requests from people who want to ask me questions specifically geared towards the difference between my traditional book writing and my blogging. I know exactly what they expect me to say because of the difference between the type of printed books that I write (handmade, years of research, traditionally published as hardbacks and then paperbacks as opposed to my online writing which could easily be stitched together as an ebook and sold online). The most recent interviewer opened her questions with “So what’s the secret to your success?” (An alien idea, that, but impossible to squash politely so I just went quiet with sheer embarrassment and pointed at a crow stealing a sandwich out the window). Then I bumbled on about not really doing anything unusual except trying to write well. I think it’s just in my DNA to want to be a better writer. Or as my granny puts it, “You were born a scribbler”. With that bit of the interview whackery thankfully out of the way the interviewer moved onto the question of ebooks and writing on digital platforms (the question she really wanted to ask in the first place). She was looking to investigate the difference between “real” books and was hoping that I would say that “blogging and one click download ebooks from Amazon.com onto my Kindle App on my Mac or iPhone were the future of publishing.” My optician would freak (I’ve started to squint quite a lot recently from screen glare) but let me be honest, realistic and frank, I don’t see publishing that way at all so I mumbled something along the lines of “Charlotte Bronte said: “Better to try all things and to find all empty, than to try nothing and leave your life a blank.” I said this because if you agree to an interview you have to say something, and it usually sounds better if it’s something at least half-decent. Also I didn’t want to be pressured into saying that ebooks are going to take over the world because I really don’t see it like this. A while ago I tapped out this post about my ten favorite books. It’s a baseline, the list that I would pack for a desert island trip. And if you’re wondering whether I’d pay extra and lug a suitcase full of printed titles to an island like in Castaway Tom Hanks style then the answer most definitely would be YES! The truth is, I love nothing more than the pleasure of a physical book. My house is lined with them. Actually as I look, there are even rows precariously leaning against by dressing table begging to be read. I spend a lot of money on hardbacks for keepsies and if I find a great book through my kindle App AND love it, I’ll buy the hardback or paperback just to have. See I support both book forms and like to own a book if it’s really great. I suppose without getting all deep about this, quite simply the pleasure of flicking through a physical book, savoring the words, studying the colours of the images and the beautiful cover art can’t be equalled YET by ebooks. That said, if you’re just talking about the simple practicality of reading plain text and fiction then after a bit of practice, I’ve found a certain way to prop up my Macbook Air or iPad like a physical book on a neat cushion so that it kind of feels like I’m reading a physical book while I sip a cup of tea. No Kindle yet then? No, not yet, I use the Kindle App. Fact.. whether it’s physical book or ebook good writing is good writing and beautiful sentence structure regardless of the medium can sometimes leave me with feelings of great despair and good old-fashioned must-try-harder thoughts. Such feelings I think serve as a constant reminder as to how much I still have to learn and keeps my feet firmly planted on terra firma. When I feel that a writer has swept me gently into his/her world then I know I am in the presence of greatness and frankly I don’t care which type of package this experience comes in (digital or traditional). But if pressed hard I will admit that the book publishing landscape is changing rapidly as will in no time be a twin of the music industry but I also feel that there are enough of us who will always want the smell of libraries, the sound of real pages and a shelf of unforgettable book covers. Question is.. are there enough of us? Hope so!